I have nothing at all against the beautiful Royal Wedding we saw today between the future King of England (Prince William) and the young woman who has come to be known as "the commoner" (Kate Middleton). In fact, I love weddings because I think one of the reasons that God gave us the institution of marriage is that even in this depraved day and age we live in, we can still look at a wedding as something lovely and pure and sacred. But all of the weddings of today and centuries past are but mere shadows of the Greatest Royal Wedding to come, when the King of Kings, the Prince of Peace, will wed his Bride and his Beloved, the Church. 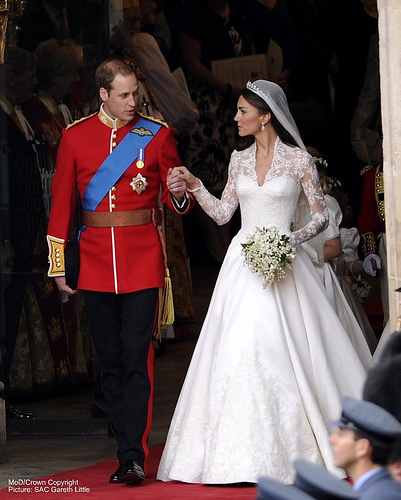 We think there is a discrepancy between the Royal Prince William and "the commoner" Kate Middleton? That is nothing compared to the vast difference between the Prince of all Princes (Jesus) and his "commoner" Bride (the Church). And yet, God in his mercy deigned to reach down into this sin sick world and take a Bride for himself.